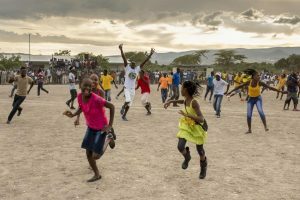 A esperança de dias melhores – ou de um “rekòmanse”, como dizem os haitianos, em crioulo – traz expectativas, sonhos, frustrações e, claro, coragem para recomeçar. 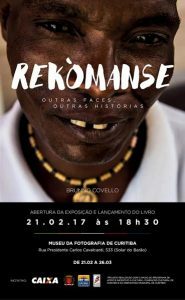 É este mix de emoções que compõe o livro de fotografias do artista Brunno Covello. 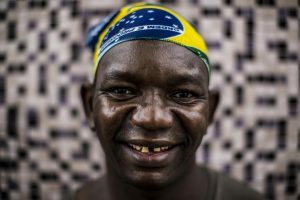 Inspirado pela trajetória dos haitianos que buscam uma vida nova em terras brasileiras, o fotógrafo imergiu na realidade deste povo. Curitiba is one of the cities that host Haitians in Brazil, after the earthquake of 2010. 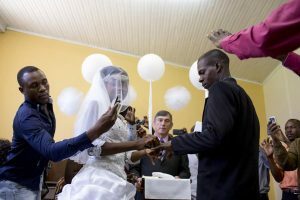 Although cases of xenophobia and prejudice, many are getting on with life.In the image, the Bedrick and Djenny wedding in Mennonite church Boqueirão, in Curitiba. The couple was three years without seeing each other. Bedrick came to Brazil to work in 2011, and to get the money for the flight ticket to Djenny, who was waiting in Haiti. She arrived in Brazil only three days before the religious marriage. At a ceremony organized by the local pastor Siegfried (center) and his wife, the party was attended by Haitians and evangelical religious descendants of Germans who attend the local church. Many were photographing and filming the event to send to relatives in Haiti.